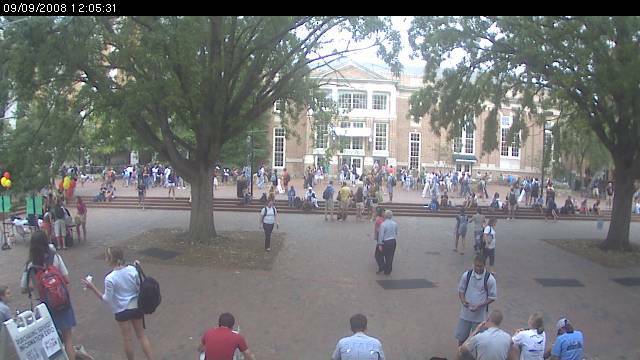 Click for a live image of The Pit. Boy: Does your family still give presents to the family pet? Girl: Yes (said in disgust). And, my mom is still all about giving my brother and me presents from ‘Santa Claus.’ Jesus, we’re old enough to drink with Santa Claus. Boy: Yeah. There’s always a Christian twist to them. Boy: You know, drinking makes things more fun. And you know, smoking gets you high. But, I just don’t like sitting around watching TV and not doing anything. Girl 1: I was looking in the mirror and I realized… I so need to get my eyebrows done today. Girl 2: Oh, yeah, me, too. And as soon as I get them done, I’m going to be ahhh pretty! Girl 1: I have to get into Chem232 in order to get to med school next year. Girl 2: Hey, I like this, I have connections. Girl 2: She’s my doctor, she’s my dentist and you can be my financial analyst. Girl 3: Wait. What about me? Girl 2: Oh, yeah, true. Well, I guess you could be my psychologist when I get older. Girl 1: OK, I have to go to class now. Girl 1: I want you to get up and walk me to class. I’m asking you. Will you get up and walk me to class? Girl 2: OK. Well we’re all sitting here. Girl 1: Well, what am I going to do!? Ergh. You mean I have to walk to class by myself? Boy: I’m OK. Everything is OK. Girl 1: With all of this Presidential stuff, I, like, haven’t heard a thing about International events. You know, like Darfur. Girl 2: What’s a darfur? Girl 1: And apparently you haven’t either. Boy: You left a puddle of slobber on my futon. Boy: And that is almost equally as appetizing. Girl: Never play drunken charades. Girl: I almost got hit by a car reenacting Abbey Road. Girl: I like Lenoir because of the M&M(R) cookies. Boy: I think I like it because I was conceived there. Girl 1: I’m so stressed out I have so many people coming into town this weekend. Girl 2: For Parents’ Weekend? Girl 1: Yeah, and I would need to hook up with like the whole team for that many tickets. Girl 1: I just don’t feel like it this week, maybe one or two of them but that’s probably not going to be enough. Boy [tall, muscular, athletic, and alone]: Man… I lost my retainer. Boy: He’s such a staunch conservative. I think the funniest story I heard about him was the one with the girl and the pants. Girl: The girl and the pants? Boy: Yah, you didn’t hear that one? Boy: Haha, OK, well it happened at some other school. He was preaching about how girls are sinful and revealing when they wear pants, and if they don’t wear skirts they’ll go to hell. And right as he was saying this, a girl walked by – in pants of course. And he points at her and says, “Like that girl wearing pants. She’s going to hell!” And the girl goes, “Oh, I shouldn’t wear these?” And she takes off her pants and walks away to class. Girl 1: I hate thieves. I mean, you can never find a pair of kickass black pants. Girl 2: Yeah, black pants are so in. Girl 1: I mean all my jewelry was stolen, too, but I really loved those pants—they were canvas and from Express. Girl 2: That is so sad. Girl 1: You’re sad? I’m sad—I’ll never find black pants like that again. Girl 2: So like your jewelry was stolen, too? Girl 1: Yeah, and I’ve had it since I was like three. And some of it was like my grandmother’s. Good thing she’s dead, I’d be in so much trouble. And like I had a gold necklace, like real gold. Girl 2: That’s so sad. Well I came up with a slogan finally. It’s ‘I heart Dune, You heart Dune—let’s Dune it,’ We can advertise it on our pants. Girl 1: Yeah, like black pants. Girl 2: Well once you find another pair. Girl 1: Oh my god — it’s raining. Girl 2: Why is it raining? Girl 3: Because there’s a hurricane. Girl 1: What’s a hurricane? Girl 2: It’s like a really bad storm. Girl 2: No stupid, it’s like Katrina. Boy 1: So when did you move in? Girl: Last week, Joe and Ed lived there all summer but their old roommate moved out in June, so he just needed someone to take his place and split the rent, you know. It’s a pretty nice little house, except for the roaches… lot of roaches. Boy 2 (Tony): No, say it aint so! Boy 1: It may still be open; they turned the lights off though. Girl: Do you know Tony? Boy 1: Yeah I think we met like last year, just real briefly. Boy 2: Yeah like sometime last spring, it was real brief though. Girl to Tony: So what have you been up to? Boy 2: Not much, I’ve got to help guide that freshman camp tomorrow. Man I’m not gonna have time to come back then. Girl: Oh well, it was good to see you. Boy 1: Yeah good to meet you again man. Girl: So I’m getting my tooth in Thursday. Boy 1: You’re tooth in? Girl: I’ve had a baby tooth since I was 14, well since I was baby, but when I was fourteen they took it out and file it down, and put it back in, I could only eat bread for a week. I get my real tooth, the tooth for the rest of my life on Thursday. I figured I would take this opportunity to own up: it was I who said “I really need to start wearing my glasses so I can judge people,” as overheard in the April 2008 issue. Yes, I was overheard and exposed by the very magazine I write for. Before anyone starts to believe that I really have been wearing my glasses more in order to pass judgment, know that that was most definitely a sarcastic comment, like most things I say. I guess everyone can learn from this—be careful what you say, Blue & White may be listening. Girl: Is that song from the 80’s? Boy: Yeah I think so, like the band with the seagulls. Girl: Seagulls? Like a song about birds? Boy: No, like the band. Girl: A band that has seagulls? Boy: No, the band is called Flock of Seagulls. Boy 2: Dude, that’s the 70’s. Girl 1: So my English professor is really hot. Girl 2: Like how hot? Girl 1: Harry Potter hot. Girl 2: Oh, like wizard hot. Girl 1: How do you think y’all came into being? Girl 2: I’m not sure, maybe God had something to do with it. Girl 1: No I meant the phrase y’all, like did some farmer pick it up one day? Girl 2: I don’t know but the farmer’s market has cool stuff. Girl 1: Yeah like granola.